Background Different amyotrophic lateral sclerosis (ALS) phenotypes have been recognised, marked by a varying involvement of spinal and bulbar upper and lower motor neurons. However, the differential characteristics of these phenotypes are still largely unknown. Objective To define the epidemiology and outcome of ALS phenotypes in a population based setting. Methods All ALS cases incident in two Italian regions were prospectively collected from 1995 to 2004 in an epidemiological register. Cases were classified according to established ALS phenotypes: classic, bulbar, flail arm, flail leg, pyramidal, respiratory, pure lower motor neuron (PLMN) and pure upper motor neuron (PUMN). Results ALS phenotype were determined in 1332 out of 1351 incident patients (98.6%). Classic and bulbar phenotypes had similar mean annual incidence rates. Gender specific incidence rates showed a male preponderance in respiratory, flail arm, classic and PLMN phenotypes; in all other phenotypes, men and women had similar incidence rates. 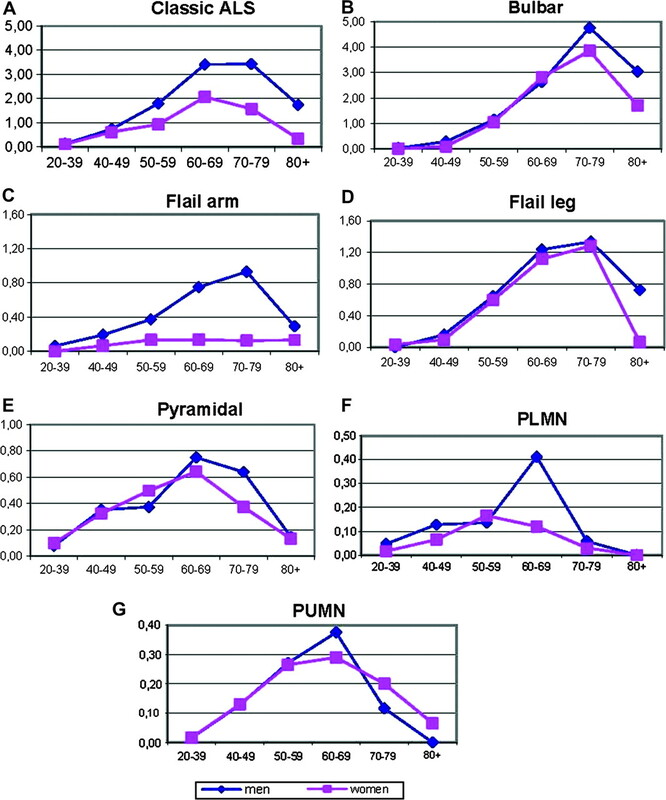 Age at onset was significantly lower in pyramidal, PLMN and PUMN phenotypes and higher in the bulbar phenotype. The best outcomes were observed in PUMN, pyramidal, PLMN and flail arm phenotypes and the worst in respiratory and bulbar phenotypes. Conclusions Our epidemiological findings suggest that ALS phenotypes carry distinctive and easily distinguishable clinical and prognostic characteristics, strongly related to a complex interplay between gender and age. The categorisation of ALS patients according to more homogenous clinical groups is relevant in identifying biological markers for ALS and should be considered for the design of clinical trials. A discussion has recently arisen concerning the possibility that different ALS presentations have different aetiologies or underlying factors—whether genetic, environmental or both—that modify the phenotype.10 However, at present, no studies have been carried out to assess and compare all ALS phenotypes using an epidemiological approach. The aim of this study was to evaluate the clinical characteristics and outcome of different ALS phenotypes in a large population based setting. The main sources of cases were the neurology departments of the two regions. Investigators used an ad hoc questionnaire to collect patient demographic data, disease history, neurological and laboratory findings, and treatments. Diagnostic EMG examination was performed in all patients according to standard procedures. The secondary sources for case collection were: the Piemonte and Valle d'Aosta Central Regional Archives; and the mortality coding from the Italian Bureau of Statistics. Clinical records of cases found through secondary sources were obtained, and relevant clinical information for each case was analysed in order to verify if the patient met the eligibility criteria; all living patients were contacted by phone and visited by one of the neurologists involved in the study. We classified the patients into the eight recognised phenotypes of ALS: classic, bulbar, flail arm, flail leg, pyramidal, respiratory, PLMN and PUMN. The classification was based on clinical data gleaned from all available sources (clinical charts, clinical notes of the collaborating centres, including the standard forms used for the register) which were prospectively collected during patient follow-up. It was established according to the clinical and EMG picture at diagnosis and revised during the follow-up. Classic ALS was characterised by onset of symptoms in the upper or lower limbs, with clear but not predominant pyramidal signs. These patients had a bulbar onset with dysarthria and/or dysphagia, tongue wasting, fasciculation and no peripheral spinal involvement for the first 6 months after symptoms onset. Pyramidal signs were not required to be evident in the first 6 months but needed to be evident thereafter. Ninety five per cent CIs were calculated assuming a Poisson distribution.16 Comparison between means were made with analysis of variance. The effect of age and gender on ALS phenotypes was assessed with multivariate analysis of variance, including age, gender and the interaction between age and gender as dependent variables. Survival was calculated to death/tracheostomy or censoring date (31 December 2009), using the Kaplan–Meier method, and compared with the log rank test. Multivariable analysis was performed with Cox's proportional hazards model (stepwise forward) (see supplementary table 2, available online, for a list of the variables included in the model). A p value <0.05 was considered significant. Data were processed using SAS statistical package (V.8.2). No patient was lost to follow-up. The study design was approved by the ethics committee of the coordinating centre. Patient consent was not required since this study did not modify the routine clinical practice. However, databases were managed according to the Italian law for the protection of privacy. A total of 1351 patients were diagnosed with ALS in the period 1995–2004 in Piemonte and Valle d'Aosta.11 Clinical phenotype was established in 1332 patients (98.6%). Clinical phenotype was established blindly by three of the authors (AC, LM, GM). When the classification differed, a discussion was undertaken to reach a consensus. In 19 patients (1.4%), no consensus was reached, mainly due to lack of full clinical details; these cases were excluded from the analysis. These patients did not differ in terms of demographic or clinical characteristics from those with full clinical details. The clinical features of ALS phenotypes are reported in table 1 and their mean annual incidence rates and gender rate ratios are shown in table 2. Classic phenotype. This is the commonest ALS phenotype in men and the second commonest in women, with a male to female rate ratio of 1.65:1. Age at onset is 62.8 years (SD 11.3), with a peak of the age specific incidence rate in the seventh decade in both genders (figure 1A). Four per cent of cases with this phenotype have FTD. Median survival time is 2.6 years (see supplementary table 1 available online only), with a 10 year survival rate of 13.0%. Bulbar phenotype. Bulbar ALS has the same incidence in the two genders (1/100 000 population), with a male to female rate ratio of 0.98:1. The peak of the age specific incidence rate is in the eighth decade in both genders (figure 1B). Nine per cent of bulbar patients have FTD, the highest figure among the ALS phenotypes. Median survival time of bulbar ALS is the second worst (2.0 years); only 3.4% of patients survived up to 10 years. Flail arm phenotype. This phenotype is relatively rare and more common in men (incidence rates 0.28 in men and 0.07 in women), with a male to female rate ratio of 4.00:1. Mean age at onset is 62.6 years (SD 11.8). In this phenotype, FTD is very rare (1.4%). Flail arm phenotype is relatively benign, with a median survival time of 4.0 years and a 10 year survival rate of 17.4%. In these patients, ALS remains restricted to the upper limbs for a mean of 20 months after onset. Flail leg phenotype. This phenotype has a similar incidence in the two genders, with a male to female rate ratio of 1.03:1. Mean age at onset is the second highest (65.0 years) and the peak of age specific incidence rate is in the eighth decade (figure 1D). FTD is present in 4% of patients with this phenotype. Median survival time (3.0 years) and the 10 year survival rate (12.8%) of this phenotype are similar to those of classic ALS. In these patients, ALS remains restricted to the upper limbs for a mean of 16 months after onset. Pyramidal phenotype. Patients with this phenotype have a quite young age at onset (58.3 years). Both genders are equally represented, with a male to female rate ratio of 1.04:1. The peak of the age specific incidence rate is in the seventh decade (figure 1E). FTD is rather uncommon (2.5%). Median survival time is 6.3 years and the 10 year survival rate is 31.9% (see supplementary table 1 available online). Respiratory phenotype. This is the rarest phenotype (annual incidence rate: men 0.06/100 000; women 0.01/100 000). Median survival time is 1.4 years and no patient with this phenotype survived up to 10 years. PLMN. PLMN has quite a low incidence rate and is twice as frequent in men (male to female rate ratio 2.04:1). 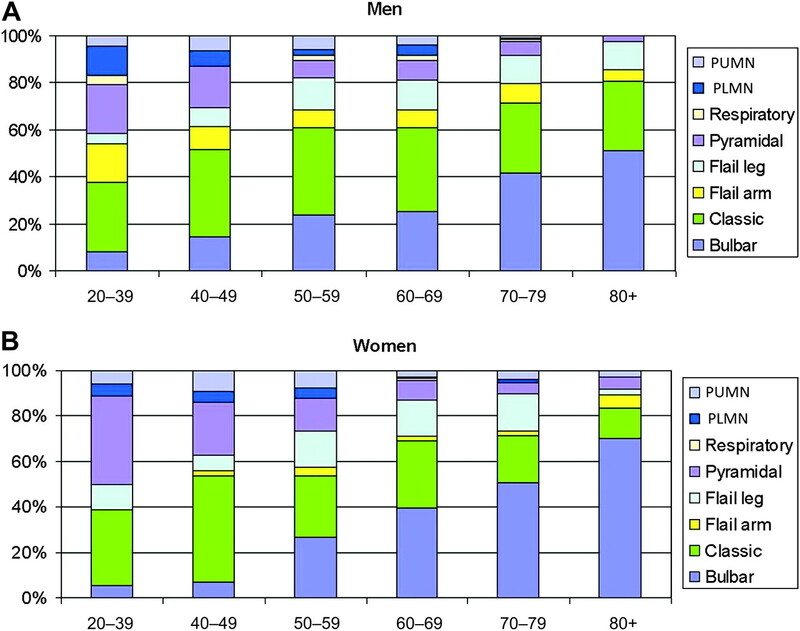 Patients with PLMN are younger than those with any other ALS phenotype (56.2 years), with a peak of the age specific incidence rate in the seventh decade among men and in the sixth decade among women (figure 1F). No patient with the PLMN phenotype developed FTD. 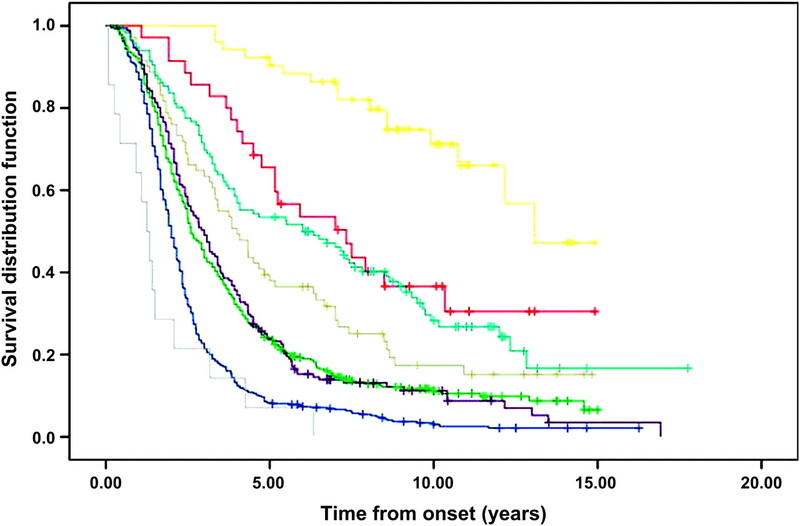 PLMN patients have a longer survival than any other phenotype besides PUMN (median survival time 7.3 years). PUMN. PUMN has a relatively low incidence rate (0.12 in both genders) and mean age at onset (58.9 years). The peak of age specific incidence rate is in the sixth decade in both genders (figure 1G). Median survival time of PUMN is the longest among ALS phenotypes (13.1 years), with a 10 year survival rate of 71.1%. Amyotrophic lateral sclerosis (ALS) phenotypes: incidence rates according to age group for males versus females. Respiratory phenotype is not shown due to the low number of cases. PLMN, pure lower motor neuron phenotype; PUMN, pure upper motor neuron phenotype. (A) Classic ALS; (B) Bulbar ALS; (C) Flail arm phenotype; (D) Flail leg phenotype; (E) Pyramidal phenotype; (F) PLMN; (G) PUMN. The relative frequency of ALS phenotypes showed an intriguing trend with age: among men (figure 2A), there was a decline in frequency of flail arm, pyramidal and classic phenotypes with increasing age, and an increase in bulbar (from 10% to 51%) and flail leg (from 0 to 12%) phenotypes; among women (figure 2B), the decline in frequency of pyramidal (from 37.5% to 6%) and classic (from 37.5% to 12%) phenotypes was even more pronounced, as well as the rise in frequency of the bulbar phenotype (from 6% to 72%). Relative frequency of amyotrophic lateral sclerosis phenotypes according to age. (A) Men; (B) women. The percentage is calculated on the incidence rates. PLMN, pure lower motor neuron phenotype; PUMN, pure upper motor neuron phenotype. According to the results of the multivariate analysis of variance, 54% of total variance of ALS phenotypes was explained by age and gender. The survival curves of ALS phenotypes are compared in figure 3. The outcome of the different phenotypes differed significantly (p<0.0001). At multivariable analysis (Cox model) (see supplementary table 2 available online only), the variables independently related to outcome were age at onset (p<0.0001), bulbar phenotype (p<0.0001), PUMN (p<0.0001), pyramidal phenotype (p<0.0001), respiratory phenotype (p<0.0001), FTD (p=0.0008) and flail arm phenotype (p=0.008). Tracheostomy free survival, according to amyotrophic lateral sclerosis (ALS) phenotype. Yellow, PUMN; red, PLMN; light blue, pyramidal ALS; grey, flail arm; violet, classic ALS; green, flail leg; blue, bulbar; cyan, respiratory. Crosses are censored patients. PLMN, pure lower motor neuron phenotype; PUMN, pure upper motor neuron phenotype. The main finding of our study is that ALS clinical phenotypes carry highly distinctive clinical, demographic and prognostic characteristics. In brief, the bulbar phenotype is typical of older patients, has similar incidence rates in the two genders and carries the worst survival. At the opposite extreme, the pyramidal phenotype and PUMN are typical of younger patients and have the most benign outcome. Flail arm phenotype is rare, more frequent in men, and has a relatively good prognosis, while flail leg phenotype, which is the third more common phenotype, has an equal incidence in both genders and a slightly worse outcome. The classic phenotype has the highest incidence among men, and carries an intermediate outcome. The male predominance generally reported in ALS17 19 is true for only four phenotypes—classic, flail arm, respiratory and PLMN. The two genders were almost equally represented among the other phenotypes. Therefore, when considering incidence rates and not absolute figures, the predominance of women in the bulbar phenotype described in clinical series appears to be simply related to the older age at onset of this phenotype. Our findings support the idea that ALS is a clinically heterogeneous disease. The heterogeneity of motor phenotypes in ALS has been recently analysed considering three symptom dimensions: body region of onset, relative mix of upper motor neuron and lower motor neuron involvement and rate of progression,2 and hypothesising that the initial trigger of ALS is a stochastic process, with an apparently random but focal initiation. According to our findings, however, the focal initiation of ALS is not entirely random as it is strongly determined by patient age and gender, as indicated by the fact that these two factors explained about 50% of the clinical variance. A previous study analysed ALS prognostic groups using a latent class clustering.25 The authors identified five classes, of which the first included most patients with classic, flail arm and flail leg phenotypes, the second, which carries the worst prognosis, includes most bulbar onset patients, and the fourth and fifth include patients with mixed phenotypes but with a milder clinical course. The reasons of the influence of these two factors on ALS clinical presentation remain unknown at present. In the preclinical model of ALS, the SOD1 transgenic mouse, male rodents carrying the human mutated gene had an earlier age at onset, an early progress of locomotor rating scores and a shorter survival than their female counterparts, with a clear gender related phenotypic dimorphism.26 27 This dimorphism has been related to gonadal hormones.28 However, in human ALS, data on reproductive factors and sexual hormones are scarce and contradictory,29 30 not allowing any definitive conclusions to be drawn. A strong effect of age and gender on clinical phenotype has also been reported in Parkinson's disease31 where the later age at onset, the more frequent presentation with tremor and the milder clinical course in women have been explained by the higher initial dopamine levels in the substantia nigra, which delay the moment of reaching a critical threshold of striatal dopamine depletion. Unfortunately, in ALS there are no studies assessing the age and gender related diversities in the motor neuron pool and the receptor function at the upper and lower motor neuron level. We conclude that our epidemiological data strongly support the fact that recognised ALS phenotypes have different clinical, demographic and outcome characteristics, and can be recognisable even in a population based setting. The pathophysiological bases of the varying pattern of motor neuron degeneration, partly related to age and gender, are still largely unknown. A better understanding of the factors that influence the phenotypic expression of ALS would be important for identifying the underlying biochemical, genetic and environmental mechanisms of the disease. Moreover, the categorisation of ALS patients according to clinical phenotypes should be considered for improving the design of clinical trials and to better focus the communication of diagnosis and outcome with patients and their families.
. Focality of upper and lower motor neuron degeneration at the clinical onset of ALS. Neurology 2007;68:1571–5.
. ALS motor phenotype heterogeneity, focality and spread. Deconstructing motor neuron degeneration. Neurology 2009;73:805–11.
. Primary lateral sclerosis: clinical features, neuropathology and diagnostic criteria. Brain 1992;115:495–520.
. Differentiation between primary lateral sclerosis and amyotrophic lateral sclerosis: examination of symptoms and signs at disease onset and during follow-up. Arch Neurol 2007;64:232–6.
. Disease course and prognostic factors of progressive muscular atrophy. Arch Neurol 2007;64:522–8.
. Natural history of young-adult amyotrophic lateral sclerosis. Neurology 2009;71:876–81.
. Clinical features that distinguish PUMN, upper motor neuron-dominant ALS, and typical ALS. Neurology 2009;72:1948–52.
. What's in a name? Lumping or splitting ALS, PLS, PMA, and the other motor neuron diseases. Neurology 2006;66:624–5.
. Epidemiology of ALS in Italy: a 10-year prospective population-based study. Neurology 2009;72:725–31.
. El Escorial World Federation of Neurology criteria for the diagnosis of amyotrophic lateral sclerosis: Subcommittee on Motor Neuron Diseases/Amyotrophic Lateral Sclerosis of the World Federation of Neurology Research Group on Neuromuscular Diseases and the El Escorial Clinical Limits of Amyotrophic Lateral Sclerosis workshop contributors. J Neurol Sci 1994;124(Suppl):96–107. The Lund and Manchester Group. Clinical and neuropathological criteria for frontotemporal dementia. J Neurol Neurosurg Psychiatry 1994;57:416–18.
. Calculating confidence intervals for rates and ratios. Neuroepidemiology 1983;2:257–65.
. Incidence of amyotrophic lateral sclerosis in Europe. J Neurol Neurosurg Psychiatry 2010;81:385–90.
. Age at onset influences on wide-ranged clinical features of sporadic amyotrophic lateral sclerosis. J Neurol Sci 2008;276:163–9.
. Clinical phenotypes and natural progression for motor neuron disease: analysis from an Australian database. Amyotroph Lateral Scler 2009;10:79–84.
. Prognostic factors in ALS: a critical review. Amyotroph Lateral Scler 2009;10:310–23.
. The natural history of primary lateral sclerosis. Neurology 2006;66:647–53.
. Brachial amyotrophic diplegia: a slowly progressive motor neuron disorder. Neurology 1999;53:1071–6.
. Treatment allocation by minimization. BMJ 2005;330:853.
. The syndromes of frontotemporal dysfunction in amyotrophic lateral sclerosis. Amyotroph Lateral Scler 2008;9:323–38.
. Latent cluster analysis of ALS phenotypes identifies prognostically differing groups. PLoS One 2009;4:e7107.
. Sexual differences in onset of disease and response to exercise in a transgenic model of ALS. Neuromuscul Disord 2003;13:737–43.
. Sexual dimorphism in disease onset and progression of a rat model of ALS. Amyotroph Lateral Scler 2007;8:20–5.
. Ovariectomy and 17beta-estradiol modulate disease progression of a mouse model of ALS. Brain Res 2004;1021:128–31.
. Estrogen replacement therapy in women with amyotrophic lateral sclerosis. J Neurol Sci 1999;169:126–7.
. Effect of reproductive factors and postmenopausal hormone use on the risk of amyotrophic lateral sclerosis. Neuroepidemiology 2006;27:117–21.
. Gender differences in Parkinson's disease. J Neurol Neurosurg Psychiatry 2007;78:819–24.
. Phenotypic heterogeneity in motor neuron disease patients with CuZn superoxide dismutase mutations in Scandinavia. Brain 1997;120:1723–37.
. Two Italian kindreds with familial amyotrophic lateral sclerosis due to FUS mutation. Neurobiol Aging 2009;30:1272–5.
. FUS mutations in sporadic amyotrophic lateral sclerosis. Neurobiol Aging Published Online First 4 February 2010. doi:10.1016/j.neurobiolaging.2009.12.020.
. Smoking may be considered an established risk factor for sporadic ALS. Neurology 2009;73:1693–8. ↵* The other members of the PARALS study group are: R Mutani, MD (Department of Neuroscience, University of Torino, Advisory Committee); M Balma, MD (Department of Neuroscience, University of Torino, site investigator); S Cammarosano, MD (Department of Neuroscience, University of Torino, site investigator); A Canosa, MD (Department of Neuroscience, University of Torino, site investigator); S Gallo, MD (Department of Neuroscience, University of Torino, site investigator); A Ilardi, MD (Department of Neuroscience, University of Torino, site investigator); L Durelli, MD (Department of Neurology, University of Torino and AOU San Luigi Gonzaga, Orbassano, Advisory Committee); B Ferrero, MD (Department of Neurology, University of Torino and AOU San Luigi Gonzaga, Orbassano, site investigator); S De Mercanti, MD (Department of Neurology, University of Torino and AOU San Luigi Gonzaga, Orbassano, site investigator); A Mauro, MD (Department of Neurorehabilitation, University of Torino, Istituto Auxologico Italiano, IRCCS, Piancavallo, Advisory Committee); M Leone, MD (Department of Neurology, University of Piemonte Orientale ‘Amedeo Avogadro’, and AOU Maggiore, Novara, Advisory Committee); F Monaco, MD (Department of Neurology, University of Piemonte Orientale ‘Amedeo Avogadro’, and AOU Maggiore, Novara, Advisory Committee), N Nasuelli, MD (Department of Neurology, University of Piemonte Orientale Amedeo Avogadro, and AOU Maggiore, Novara, site investigator); L Sosso, MD (Department of Neurology, Ospedale Mauriziano, Torino, site investigator); M Gionco, MD (Department of Neurology, Ospedale Mauriziano, Torino, site investigator); A Marchet, MD (Department of Neurology, Ospedale Martini, Torino, site investigator); C Buffa, MD (Department of Neurology, Ospedale Maria Vittoria, Torino, Advisory Committee); R Cavallo, MD (Department of Neurology, Ospedale S Giovanni Bosco, Torino, site investigator) E Oddenino, MD (Department of Neurology, Ospedale Gradenigo, Torino, site investigator); C Geda, MD (Department of Neurology, Ospedale di Ivrea, and Department of Neurology, Ospedale di Chivasso, site investigator); C Doriguzzi Bozzo, MD (Department of Neurology, Ospedale di Pinerolo, site investigator), U Magliola, MD (Department of Neurology, Ospedale di Pinerolo, site investigator); D Papurello, MD (Department of Neurology, Ospedale di Ciriè, site investigator); P Santimaria, MD (Department of Neurology, Ospedale di Vercelli, site investigator); U Massazza, MD (Department of Neurology, Ospedale di Biella, site investigator); A Villani, MD (Department of Neurology, Ospedale di Domodossola, Advisory Committee) R Conti, MD (Department of Neurology, Ospedale di Domodossola, site investigator); F Pisano, MD (Fondazione Salvatore Maugeri, Clinica del Lavoro e della Riabilitazione, IRCCS, Scientific Institute of Veruno, site investigator); M Palermo, MD (Department of Neurology, Azienda Ospedaliera Santi Antonio e Biagio, Alessandria, site investigator); F Vergnano, MD (Department of Neurology, Ospedale di Casale Monferrato, site investigator); MT Penza, MD (Department of Neurology, Ospedale di Tortona, site investigator); N Di Vito, MD (Department of Neurology, Ospedale di Asti, site investigator); M Aguggia, MD (Department of Neurology, Ospedale di Asti, site investigator); I Pastore, MD (Department of Neurology, Azienda Ospedaliera S Croce e Carle, Cuneo, site investigator); P Meineri, MD (Department of Neurology, Azienda Ospedaliera S Croce e Carle, Cuneo, Advisory Committee); P Ghiglione MD (Department of Neurology, Ospedale di Savigliano, site investigator); D Seliak, MD (Department of Neurology, Ospedale di Savigliano, site investigator); C Cavestro, MD (Department of Neurology, Ospedale di Alba, site investigator); G Astegiano, MD (Department of Neurology, Ospedale di Alba, site investigator); G Corso, MD (Department of Neurology, Ospedale Regionale di Aosta, site investigator); E Bottacchi, MD Department of Neurology, Ospedale Regionale di Aosta, Advisory Committee). Funding This paper was supported in part by grants from Regione Piemonte (Ricerca Finalizzata 2002, grant No 12944; Ricerca Scientifica Applicata 2004, grant No A317) and Compagnia di San Paolo (grant No 2003.0078). Ethics approval This study was conducted with the approval of the Comitato Etico Ospedale Molinette, Torino, Italy.